The first blue gel nasal mask with Auto Seal technology. What if you could have a CPAP mask that was so comfortable and fit so well, it's as if it wasn't there at all? TrueBlue brings our best technologies together in one mask. Designed to push the limits of performance and fit, this mask sets the gold standard for a good night's sleep. The TrueBlue gel nasal mask with Auto Seal technology is designed to deliver a higher degree of comfort, stability, and freedom of movement with minimal adjustments. This intuitive gel mask is designed for quicker set-up and fitting, fewer callbacks, and easier lab titration. With TrueBlue, you can deliver a more complete sleep solution. Why settle for anything less? Designed to the highest standards - yours. 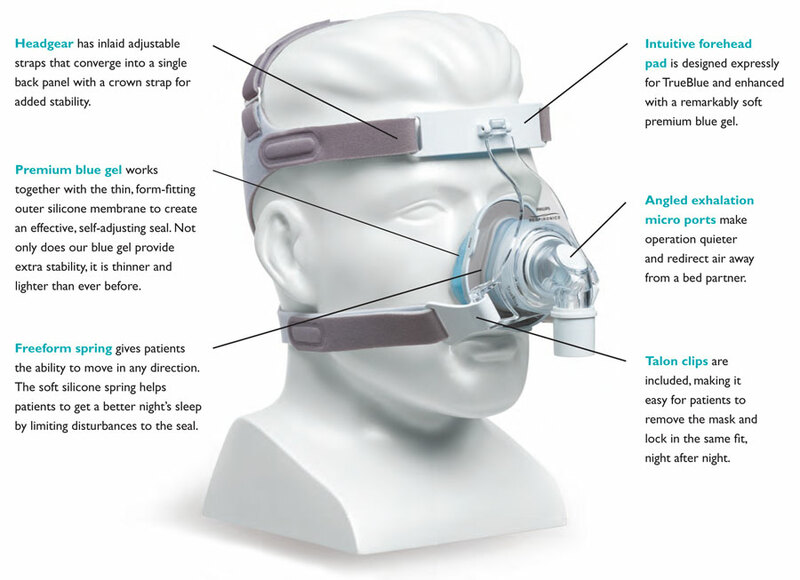 Take a closer look at a mask built to your high standards and learn what makes the TrueBlue nasal mask with Auto Seal technology a more complete sleep solution.